RAWANG is home to several established townships, including Bandar Country Homes by Tanco Holdings Bhd and Emerald City by GuocoLand Malaysia Bhd, as well as smaller developments. Improved infrastructure, including the KL-Kuala Selangor Expressway (Latar Expressway), North–South Expressway and Guthrie Corridor Expressway, have further driven its growth. 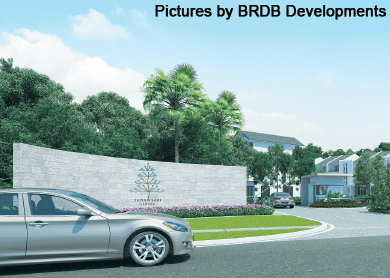 Come May 16, Rawang will see the launch of its newest township — Taman Sari by BRDB Developments Sdn Bhd (formerly known as Bandar Raya Developments Sdn Bhd). The 265-acre Taman Sari, which is BRDB’s second township development, has a gross development value (GDV) of RM2 billion. The freehold township, which is just a three-minute drive to Rawang town, will be developed in 16 phases over 10 years, BRDB’s KL property development division acting CEO, Edwin Yang tells City & Country. “Taman Sari was conceptualised from the beautiful gardens in Yogyakarta in Indonesia. It’s a place where you will find peace of mind while being surrounded by ample landscaped greenery within a highly secure neighbourhood,” he says. The township will comprise 2,000 residential units — terraced houses, bungalows and condominiums — together with some commercial units and education facilities. 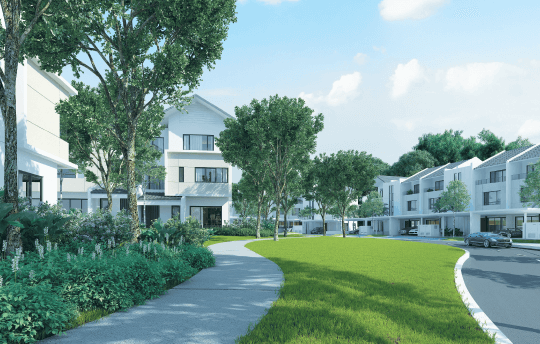 The first phase, Amaryllis, with a GDV of RM121 million, will consist of 117 units of 3-storey super terraced houses with built-ups ranging from 3,033 to 4,003 sq ft. Prices start at RM895,000. He adds that the designs offer better privacy. He says it costs a little more to build such designer houses but it is part of BRDB’s DNA. The architects for Amaryllis are KL-based GDP Architects. The project is due for completion in 2018. Amenities nearby include AEON Rawang, which is just across the road from Taman Sari. Apart from the concept, Yang believes the ample greenery will attract families and upgraders from around the area and other parts of the Klang Valley. “Rawang has many old houses and the residents want to move to a new place, but there aren’t many choices. Taman Sari offers them not just a home but also a lifestyle where they can enjoy peace and security,” says Yang. “We are targeting executives and professionals who have just started a family, and upgraders from the area. “I think connectivity is important and looking at the highways connecting to Rawang, such as the Latar Expressway, travelling time to Rawang from KL has been reduced,” he says. Taman Sari is only 300m from the Rawang toll plaza, he notes. The property market in Rawang has been robust in the past five years, says Avtar Singh, director of Carey Real Estate (Ampang) Sdn Bhd. However, there is a surplus of 1-storey factories and shophouses on the outskirts, he adds. However, the potential of the area remained, and in 2010, prices began to gradually rise. The scarcity of development land and higher prices of properties nearer to KL also contributed to the rising values. Apart from that, Rawang is now part of Greater Kuala Lumpur, he adds. Property prices in Rawang, Avtar says, have increased 50% to 100% in some prime locations, especially in gated and guarded schemes such as Emerald City and Bandar Country Homes. On average, properties in gated schemes have risen 10% to 20% per annum. As Rawang continues to grow, land prices have increased as well, including for commercial and industrial parcels. “Generally, residential, commercial and industrial land has appreciated an average of 50% to 100%, depending on the locations, such as whether the land is near existing developments and amenities, as well as public transport,” Avtar adds. Metro Homes Sdn Bhd senior negotiator, Davies Lowe says properties in Rawang are enjoying good capital appreciation due to AEON Rawang, which opened two years ago. He adds that rents have also increased, for example, intermediate 2-storey terraced houses in Bandar Country Homes are rented out for RM800 per month compared with RM300 10 years ago. He believes that Rawang will be a vibrant place to live in as major developers such as S P Setia Bhd, Mah Sing Group Bhd and Gamuda Bhd are coming in.